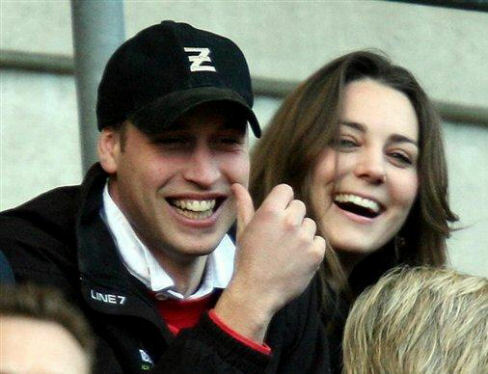 How could we possibly resist an Etiquette Wednesday with William & Kate after hearing that Buckingham Palace has mailed a 22-page booklet on etiquette to all of the guests invited to the wedding? Some people have found this to be an entertaining, if not laughable gesture. I am not one of them. How should a man greet the Queen? A man should give a swift bow of the head, not a bow from the waist when meeting the Queen. Men should also briefly lower their eyes during their greeting, and bow again when the Royal family member leaves. How should a Woman greet the Queen? A woman should give a small, dignified curtsey upon meeting the Queen. The move should create a distinct bobbing movement, with the upper body kept straight and should be repeated when the member of the Royal family leaves. How do you address the Queen? So, you have a date or a friend by your side, how do you introduce them to The Queen? How do you enter and leave the Abbey in style? The Queen is always supposed to enter the abbey last and be the first to depart, so make sure a) you arrive early b) you don’t rush out of the abbey before the Queen. Guests are asked to arrive at least 20 minutes before the ceremony begins. As the Queen enters Westminster Abbey, everybody has to acknowledge her arrival with a curtsey or bow as she walks through. The same must happen as she leaves. Wearing the right hat and not overdoing it is important. Wearing cream or white is not appropriate. That must be left to the bride. Men in the Armed Forces should wear uniform and male civilians a lounge or morning suit. 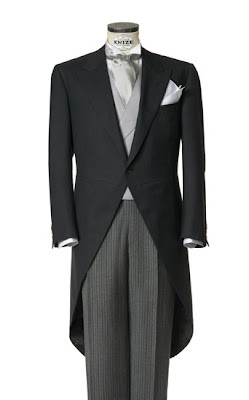 A top hat should be carried, not worn, inside the church. There will be champagne flowing and you’ve got to hold the glass properly, by the stem. With teacups, lift the cup not the saucer and hold it very gently with your index finger and thumb, returning the cup to the saucer after every sip. It's quite simple - start at the outside and work in as the meal progresses. The soup spoon will always be on the extreme right if soup is the first course. It will be second from the right if served as a second course. Dessert cutlery will always be at the top of the place setting with the fork facing right and the spoon above it facing left. Glasses are also placed in the order in which they are used. So, for example, water, champagne, white wine, red wine, dessert wine. 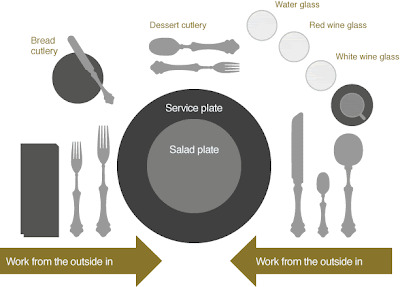 A napkin might be placed on the plate or to the left of the forks. Some dishes require their own etiquette. Bread rolls: don't cut with a knife - break with fingers. Soup: tip the bowl and scoop the spoon away from you; sip, don't slurp. Asparagus: eaten with fingers, start with the head. Oysters: use an oyster fork to detach the oyster from its shell. Hold the shell between thumb and first two fingers, place against lower lip and slide the oyster and its juice out of the half shell. Don't swallow it whole. Chew slowly and savour. OK, Between Buckingham Palace, the BBC and Me, you are good to go – to the Royal Wedding. And what if you didn’t get invited? Well I suggest you get into your mourning clothes (for you that would be your jammies as the wedding coverage begins at 5:30 AM. As you watch, you can offer up your own etiquette critique to all your friends. And while you are drinking champagne, remember to hold the class by the stem and you will be fine. P.S. I am beginning to think that everyone who presides over a house be they mom or chatelaine -- should produce their own etiquette booklet for those visitors who might not know how to eat oysters or other things. Love the Wendy Williams reference -she's my gurl! How YOU doin? I never knew asparagus was eaten with the fingers -that sounds so messy! I thought I was raised right but I must have missed the lessons on asparagus as a finger food and dessert cutlery worn on the place setting like an eyebrow. Thank God the rest looked familiar! Who knew growing up Southern would come in handy when in the presence of royalty. Well, except for knowing what a lounge suit was. But yes, we do eat asparagus with our fingers Down South. And brides (and former beauty pagant queens) never pass up the opportunity to wear a tiara. What an informative (and entertaining) post! Here in NZ, we are really looking forward to the wedding, bringing up our ties as a British colony. We get to watch it at 9:30pm, just before bed! How I loved this! Here ooooooop North where it's grim we will be celebrating the wedding with salmon sandwiches and champagne. I will be watching TV coverage from 8am, in my posh clothes. I will however be wearing my slippers! lol! Loved this. Who cares? After all Kate is just a person without charisma, sine nobilitas.